Intramuscular injection, often abbreviated IM, is the injection of a substance directly into muscle. In medicine, it is one of several alternative methods for the administration of medications (see route of administration). Muscles have larger and more blood vessels than subcutaneous tissue and injections here usually have faster rates of absorption than subcutaneous injections or intradermal injections. Depending on the injection site, an administration is limited to between 2 and 5 milliliters of fluid. Vaccines are often administered as IM injections. Influenza vaccines based on inactivated viruses are commonly administered intramuscularly (although there is active research being conducted as to the best route of administration). Platelet-rich plasma injections can be administered intramuscularly. Certain substances (e.g. ketamine) are injected intramuscularly for recreational purposes. Possible sites for IM injection include: deltoid, dorsogluteal, rectus femoris, vastus lateralis and ventrogluteal muscles. Sites that are bruised, tender, red, swollen, inflamed or scarred are avoided. The deltoid muscle site (upper arm) is recommended for use with injections of small volume, usually equal or less than 2 ml, including vaccinations. This site is not recommended for repeated injections, due to its small area, it is difficult to rotate the injection site. To locate the site, palpate the lower edge of the acromion process. Inject in the upside down triangle that forms with its base at the acromion process and its midpoint in line with the axilla. The ventrogluteal site (hip) is recommended for injections requiring a larger volume to be administered, greater than 1 ml, and for medications known to be irritating, viscous or oily. It is also given for narcotic, antibiotic, sedative and anti-emetic medications. To locate the ventrogluteal site, place the palm of your hand over the greater trochanter, with the fingers facing the patient's head. The right hand is used for the left hip and left hand is used for the right hip. Place the index finger on the anterior superior iliac spine and run the middle finger back along the iliac crest. The injection is given in the center of the triangle that is formed. The vastus lateralis site is the recommended site for infants less than 7 months old and those unable to walk, with loss of muscular tone. To locate the site, divide the front thigh into thirds vertically and horizontally to make nine squares and inject in the outer middle square. 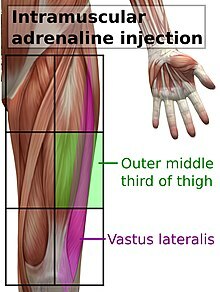 It is also recommended for epinephrine autoinjectors, in such cases in the middle of the outer side of the thigh, corresponding to the location of the vastus lateralis muscle. The dorsogluteal (buttock) site is not recommended for use in any patient population due to its location near major blood vessels and nerves, as well as having inconsistent depth of adipose tissue, with very few injections in this area injected to the correct depth to administer as a true intramuscular injection. Use of this site is associated with skin and tissue trauma, muscle fibrosis and contracture, haematoma, nerve palsy and paralysis, as well as infectious processes such as abscess and gangrene. Despite the goal of healthcare in many countries to follow evidence based practices, this site is commonly preferred by healthcare professionals against research recommendation, often due to a lack of knowledge surrounding alternative sites for injection. The injection site is located by dividing the buttock into four with a plus (+) shaped cross, and administering the injection in the upper outer quadrant. This is the only intramuscular injection site for which research recommends aspiration (drawing back) of the syringe prior to injection, due to higher likelihood of accidental intravenous administration in this area. The selected site is cleansed with an antimicrobial and is allowed to dry. It is injected with the dominant hand using a quick, darting motion perpendicular to the patient's body at an angle between 72 and 90 degrees, as a faster injection is less painful. The needle is then stabilized with the nondominant hand while the dominant hand slides to the plunger to slowly instill the medication, as a rapid injection causes more discomfort. The CDC does not recommend the outdated practice of aspirating for blood to rule out injecting into a blood vessel. The needle is withdrawn at the same angle inserted. Using the "Z track" or zigzag technique is recommended, where the skin is pulled and held down to one side with the nondominant hand about an inch and after the needle is withdrawn the displaced skin is allowed to return to its normal position. This is to ensure that the medication does not leak back along the needle track. Gentle pressure is applied with a gauze but the site is not massaged to prevent forcing the medication into subcutaneous tissue. ^ a b c d e Taylor, C. R., Lillis, C., LeMone, P., Lynn, P. (2011) Fundamentals of nursing: The art and science of nursing care. Philadelphia: Lippincott Williams & Wilkins, page 751. ^ a b c d e f g h Mann, E. (2016). Injection (Intramuscular): Clinician Information. The Johanna Briggs Institute. ^ Cocoman, A., & Murray, J. (2010). Recognizing the evidence and changing practice on injection sites. British Journal of Nursing, 19(18), 1170-1174. ^ Lynn, P. (2011) Lippincott's photo atlas of medication administration. Philadelphia: Lippincott Williams & Wilkins, pages 39-40.